The Chronicles of Narnia were the first chapter books my father read to me as bed-time stories. The Silver Chair was my favorite as a kid - due entirely, I think, to my father's excellent voice impressions of Puddleglum the Marsh-wiggle. When Fandom Foodies announced their December theme would be Aslan's Feast, Puddleglum's freshly-caught fishy fare was the first thing that came to my mind! 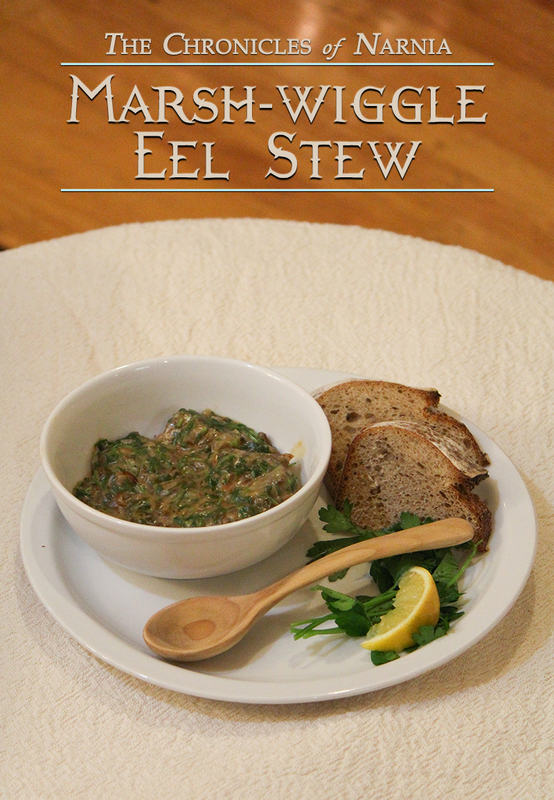 When developing the recipe for Marsh-wiggle Eel Stew, I drew inspiration from the Flemish stew-like eel entree Paling in 't Groen, which is essentially eel simmered in a white wine sauce flavored with an assortment of fresh herbs. However, eels stewed in fresh herbs is a tradition reaching far back; it appears in the 14th century recipe book Forme of Cury as well as in the 1861 cookbook The Housekeeper's Encyclopedia. This recipe captures the feel of Eustace and Jill's meal with the marsh-wiggle well - the herbs and shallot could all be gathered from along the river bank where Puddleglum catches the eels. Eel is a little tricky to find outside of season (late spring). Some well-stocked fish stores may have it frozen year round, but call ahead of time to check. I didn't have much luck finding eel at asian specialty stores - it was all precooked in soy sauce. If eel seems a little too icky to you, substitute with your favorite mild-tasting fish and adjust the cooking time accordingly. The light-tasting sauce will be overpowered by any strongly fishy substitute. Aim instead for something like cod, or even chicken. I used about equal parts chervil, sorrel, mint and parsley. You could also use rosemary, sage, savory, fennel fronds, marjoram, or whatever green things you think Puddleglum might have encountered in the marshes. Heat a skillet over medium heat and melt the butter. Saute the shallots until translucent (1-2 minutes). Add the eel to the skillet and brown for 1 minute per side. Sprinkle on the flour and stir quickly into the oil, until well mixed. Pour on the white wine and stir to combine with the butter and flour mixture. Add in the fish stock. Simmer until the eel is tender - about 8 minutes - stirring regularly. Add a little extra wine or stock as necessary to keep the consistency thick enough to coat the back of your spoon. 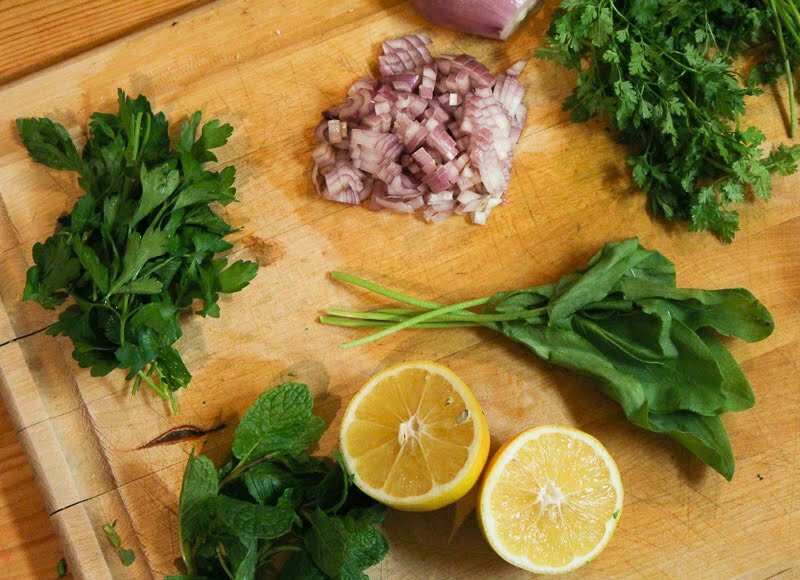 Stir in the lemon juice and the herbs. Cook until the herbs are just wilted. "When the meal came it was delicious and the children had two large helpings each. At first the Marsh-wiggle wouldn't believe that they really liked it, and when they had eaten so much that he had to believe them, he fell abck on saying that it would probably disagree with them horribly. "What's food for wiggles may be poison for humans, I shouldn't wonder," he said. What's food for wiggles also makes a delicious dinner for humans. The lemon juice and fresh leaves lend a bright and green taste to this fish dish. The recipe comes together quickly and can be easily adapted to include whichever green leafy things you might have in your fridge. Substituting the eel for an easy-to-acquire fish like cod would make this a practical meal for a busy night when you still wanted a little bit of Narnia with your meal. Don't cook the greens for too long or they will loose their beautiful color. Adding spinach into the mixture will brighten the green hue, but is less traditional in the Flemish and Medieval dishes that inspired this stew. For more on silver chairs, check out my DIY Iron Throne (Sorry! I couldn't resist! ).